Storms were forecast, but the sun still shone on Munich’s Marienplatz on Thursday, 10 May. At 12.30 pm, the square fills up – nothing particularly unusual for a holiday (Ascension Day, a bank holiday in Bavaria), when tourists routinely assemble to watch the Glockenspiel in the tower. But more and more people crowded into the square, bearing signs, posters, banners, even clothing emblazoned with slogans. When the #noPAG demonstration – a protest organised against the new Polizeiaufgabengesetz, or Policing Regulations Act – was about to start, 15,000 people had already crushed in. “Wow! There’s a LOT of you!” announced one of the organisers over the Tannoy. The announcement was met with a roar of delight. There were too many people to make opening remarks, the voice gleefully continued. They would keep their speeches until after the march. “Like old times,” says Munich resident Helga Kamy. 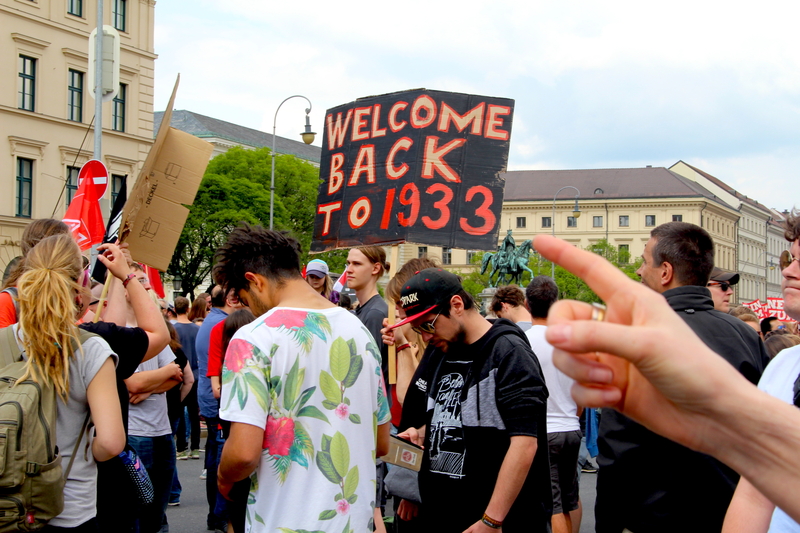 More than 30,000 people assembled on 10 May to protest against the revised Polizeiaufgabengesetz, (Policing Regulations Act). 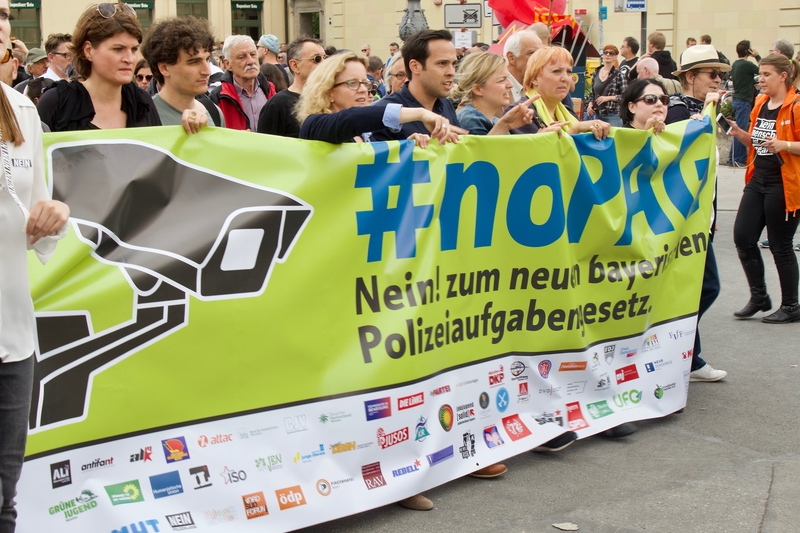 The unexpectedly enormous surge of nay-sayers indicates the fear and anger regarding a law that will give the Bavarian police force unprecedented power to conduct surveillance and detain individuals – some say, to levels not experienced since the Nazi regime. The great complexity of the new legislation does little to allay concerns. The act under discussion is not a new law but an amendment of an old one. Every state in the Federal Republic of Germany has its own police force and its own policing regulations. In Bavaria this is called the Polizeiaufgabengesetz(PAG). It was initially enacted in 1955 and is regularly amended as required. Recent rulings by the Bundesverfassungsgericht(Federal Constitutional Court) regarding data protection and the responsibilities of the Bundeskriminalamt(BKA) the Federal Criminal Police Office, have made it necessary for all German states to update their policing laws. In response, the Bavarian government already updated its PAG in 2017; it went through without much uproar in a national election year, apart from strong objection from the Green party, which voted against the amendment. In response to the constitutional ruling, the new PAG is designed to enhance data protection. An independent body will in future be entrusted with determining whether Internet surveillance may be undertaken. But other unrelated measures are also included in the law. For example, the changes giving the Bavarian police increased powers of investigation go beyond the area of terrorism prevention, the original scope of the BKA judgment. One of the biggest issues with the new PAG is the concept of “drohende Gefahr” – imminent/threat of danger – a term taken from the BKA ruling. The proposed change will give the Bavarian police the power to take action when a threat of danger is perceived, not only when there is a real and present danger is identified (konkrete Gefahr). This would mean the police could take preventative measures based on assumptions derived from collected evidence. Methods of collection include phone tapping, secret investigations and online surveillance. Some enhanced powers to gather this evidence are also a feature of this law – for example, the extended use of DNA evidence. Up to now, police were only able to use the DNA harvested from a crime scene in order to compare it with that of the alleged perpetrator or witnesses. Under the terms of the new PAG, they would be able to use samples to build a DNA profile of the suspect, including hair and eye colour and – controversially – area of origin. The police would also be able to seize letters and parcels, and assess them. This measure is designed to prevent the delivery of drugs and weapons obtained on the darknet. The suitability of all these measures would have to be determined by a judge before implementation. Additionally, the bodycams that many Bavarian police already wear would be set to film continually, rather than be switched on manually by the individual officer. Instead of pushing a button to turn the camera on, the button would be used to record the footage permanently. Otherwise, the film recordings made by the camera would be overwritten. Another feature of the PAG is the ability theoretically to detain someone indefinitely without trial. Before the previous incarnation of PAG in 2017, a suspect could be put in preventative detention for only 14 days. Under the new law, suspects can be jailed for up to three months, after which a judge can determine whether to extend the detention period for another three-month period. A suspect may therefore be locked up until a judge decides otherwise – there is no limit placed on the detention period. Critics of the PAG declare that these elements infringe on individual and personal rights and are unconstitutional. The concept of “drohende Gefahr”, for example, is too vague, they argue. A more precise definition should be necessary before the police may interfere with the rights accorded to the individual under law. They point out that the German constitutional court used the concept of “drohende Gefahr” in the context of terrorism prevention – but the PAG extends it more broadly into other areas of criminality, such as stalking. 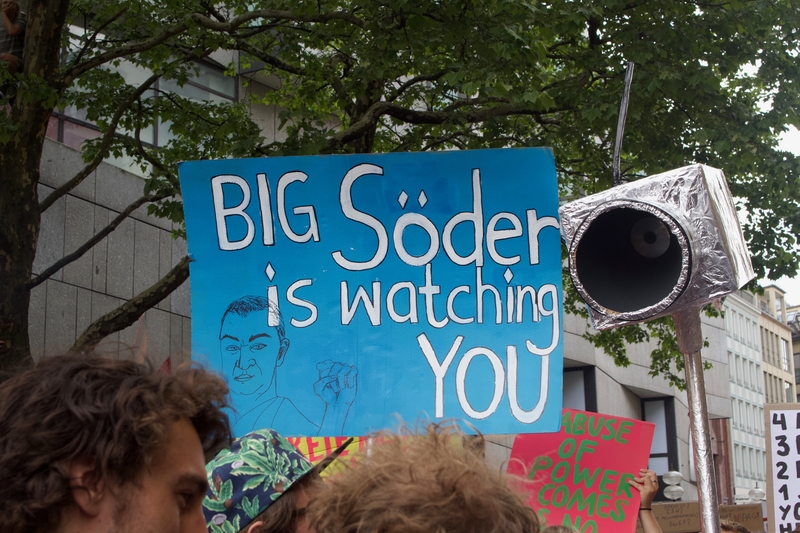 The spectre of cyber-surveillance, bodycams, electronic tagging, face recognition CCTV and extended dragnet Internet searching has also alarmed people – many of whom swelled the ranks of the demonstrations in Bavaria, particularly the one in Munich. At a weekend conference of the CSU, the reigning party in the Bavarian parliament, Bavarian minister of state Markus Söder struck a conciliatory tone. “The whole aim is to avoid victims of crime,” he states. “We’re taking concerns seriously.” Insisting that the law will go through as written, he nevertheless expressed a desire to broaden dialogue. He announced plans to create a committee composed of data protection and constitutional law experts and former police practitioners, possibly also citizen representatives, to observe and report on the way the law is practised in the next three to four months. 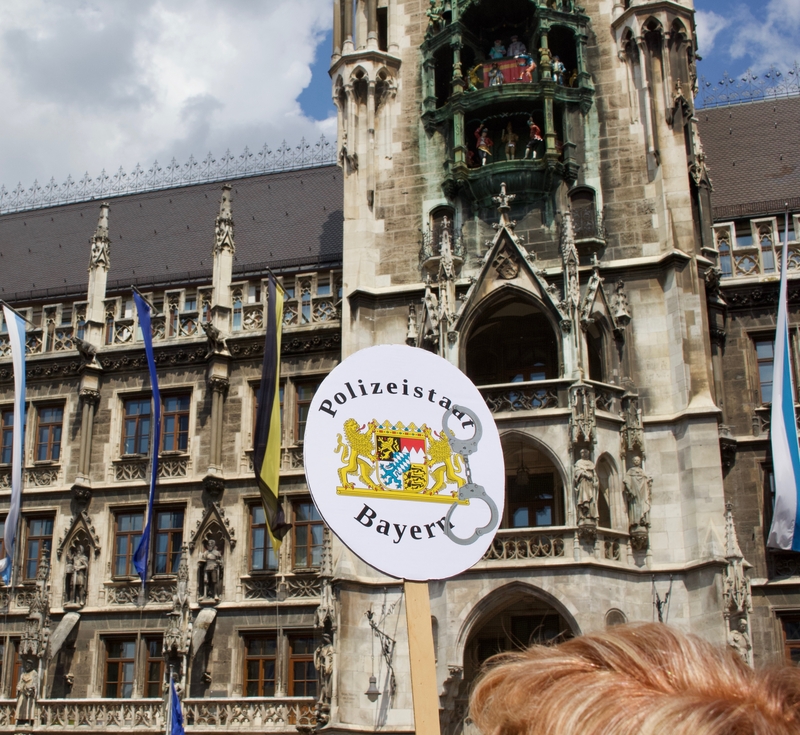 The CSU is determined to push the PAG through and – as they have a majority in the Bavarian parliament, no one seriously doubts that it won’t be passed. But apart from introducing controversial changes to the powers of the police force, the PAG is politically crucial to the CSU. Bavaria will hold its state and local elections in October this year, and all parties have a vital stake in the future of this policing regulations act. 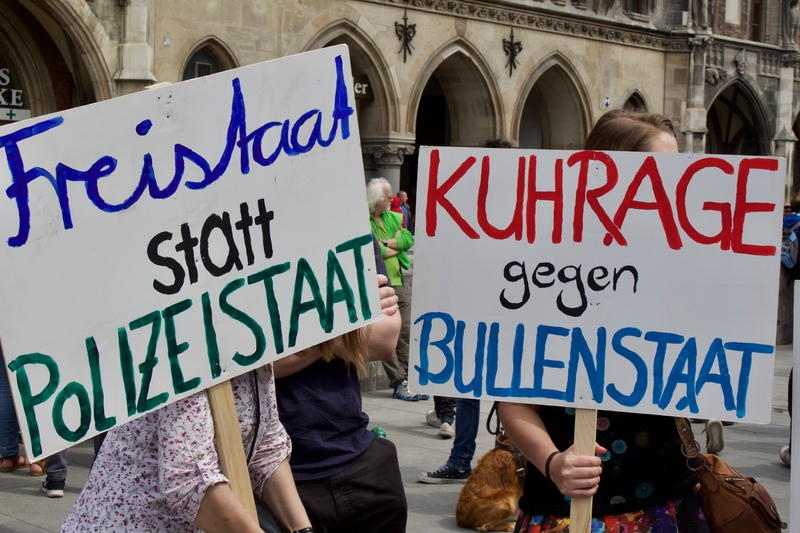 The CSU is under pressure to re-establish its mandate and strength in Bavaria after last year’s sobering loss of voters to the far-right party Alternativ für Deutschland. Newly minted federal Minister of the Interior Horst Seehofer, the former Bavarian prime minister, sees the law as a prototype for other federal states. But the PAG can only serve as a basis for discussion. It will, however, increase the political pressure on other states to ramp up the security measures made available to the police. 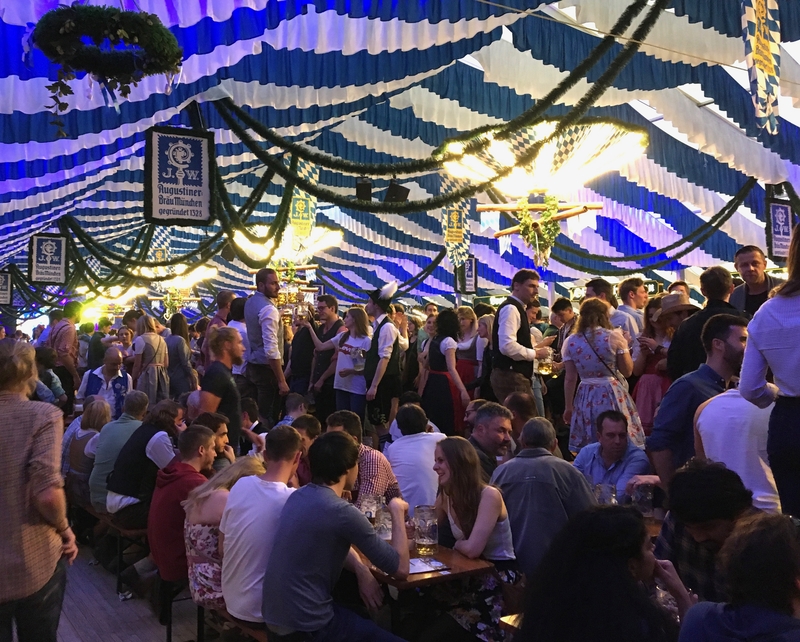 “Ein Prosit der Gemütlichkeit!” Thousands of young people are standing on beer table benches – when they’re not jumping up and down on them – bellowing the traditional Bavarian beer-drinking song along with the band. They’re at the Frühlingsfest, a kind of mini Oktoberfest in April and May on the same festival grounds. Even though their final year leaving exams are taking place during these weeks, having a stonkingly great time. The phrase could be translated as “A toast to relaxed, good times”. Gemütlichkeit is a very hard word to render in German, and Bavarians have basically claimed it for their own. It carries the sense of cosiness and relaxed, jolly conviviality. Gemütlich, however, is exactly what it isn’t in the beer tent. This is more like a rock concert, the tent jammed to the rafters, the crowd shouting along to the band playing oldies from the 80s and 90s. The people dancing on the tables are drunk on beer and enthusiasm. Most of them are dressed in Lederhosen and Dirndls. I’m sitting in a section on the side with a workplace group that booked its table in advance. It’s clearly not the cool place to be. At the adjacent table, a woman in traditional dress, who’s realised this and doesn’t like it, stands up by herself on the bench her comrades are sitting on and jumps up and down. By the time I leave, she’s got her boyfriend to join her. I can’t hear myself think, let alone hold a conversation with anyone whose ear is further than two centimetres from my mouth, but that’s hardly the point. The atmosphere is electric and infectious – as the woman jumping and swaying dangerously on her bench next to me would concur. There’s a greater sense of Gemütlichkeit a week later at a very different gathering. On 10 May – Ascension Day, a bank holiday in Catholic Bavaria – a crowd assembles on the Marienplatz, the main town square in city centre Munich. They’re coming together for a demonstration to protest the new Polizeiaufgabengesetz (PAG), a policing regulations act that will give the Bavarian police force enlarged powers of surveillance, allow them to take action in “threatening danger” (as opposed to “explicit danger”) and theoretically make it possible to detain someone indefinitely without trial. The organisers of #noPAG are expecting 7,000 protesters. Up to 40,000 people turn up, carrying signs and banners, wearing T-shirts and stickers with anti-PAG slogans. Like at a rock concert, the sense of belonging, of coming together for a common cause is strong, the camaraderie palpable. The Marienplatz is so full it’s impossible to manoeuvre through. The crowd swells into the side streets on all sides as far as the eye can see. 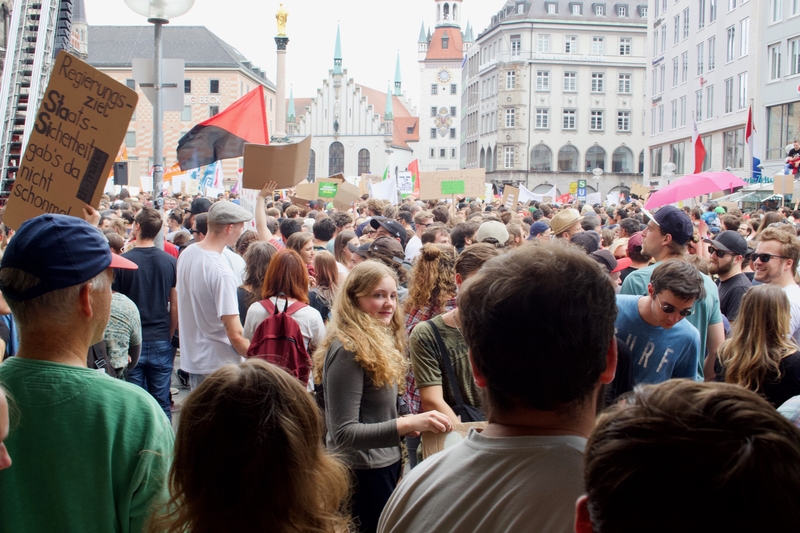 When they start their planned one-kilometre march, there are so many more people than expected that the first people in the parade reach the end point at Odeonsplatz before the last stragglers on Marienplatz have even begun to move. 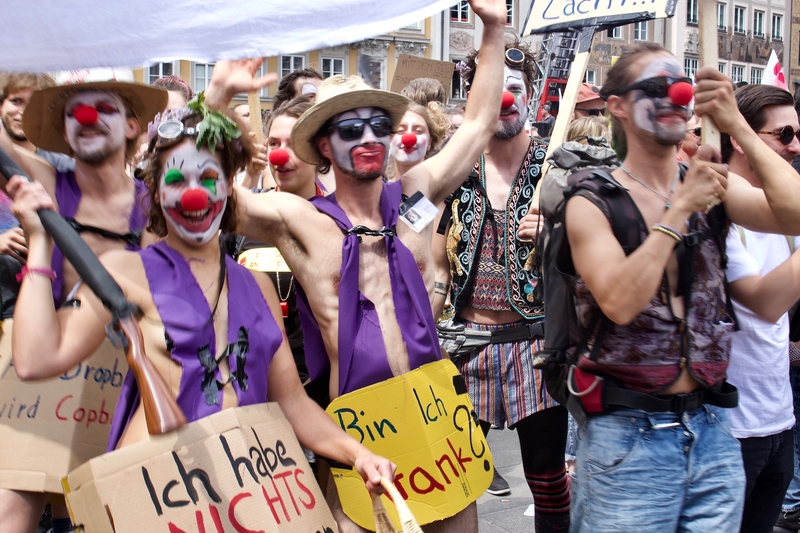 The governing party, the CSU, immediately criticised the demonstration and its organisers, the minister for the interior saying the protest was based Lügenpropaganda (mendacious propaganda, something that sounds a lot like “fake news”). The Bavarian minister president, despite sticking to his policy, strikes a more conciliatory tone, wanting to enter into dialogue with the PAG’s critics. The opposition, including the SPD, Green, Linke and other parties and organisations, continue adamantly to oppose the revised law. The government maintains the new law is necessary to ensure safety. The opposition asserts that it transgresses the federal constitution, encroaching on personal freedoms and privacy. Bavaria will host state and local elections in October this year. The lines of opposition are sharpening. The one thing they all have in common: they believe in the Bavarian state and their ability to represent it. Their vision of how to uphold a peaceful, functioning and indeed gemütlichBavaria differ widely.